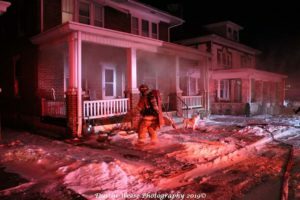 01-30-19 At 1808 hrs box 40-1 was struck for a report chimney fire. Capt. 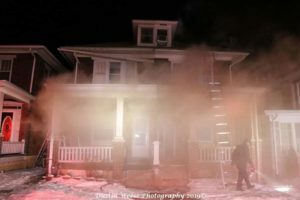 32 arrived on the scene and took command and updated with heavy smoke from the chimney. 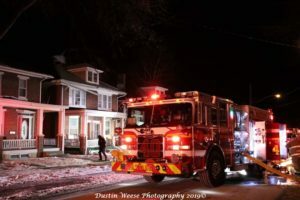 Engine responded with a crew of 4 and the rescue with a crew of 3. Engine 40 arrived and picked up it’s water source and laid into the structure leaving room for the truck. Engine crew made entry into the home and hand a heavy smoke condition upon entry. Crew made it’s way to the basement and found a fire in the ceiling. 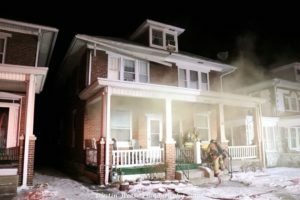 Mutual aid companies assisted with salvage and overhaul and ventilation. Control was marked in 32 mins. Time out was 2 hrs 4 mins. Photo credit to Dustin Weese.